Muhammad Fraser-Rahim's areas of expertise include Islamic intellectual history, comparative religion and Islamic philosophy/spirituality. In addition, Mr. Fraser-Rahim worked for the United States Government for more than a decade providing strategic advice and executive branch analytical support on countering violent extremism issues to the White House and the National Security Council. He completed advanced level Arabic language certificates at various higher education institutions in the US, West Africa and the Middle East. He holds a PhD from Howard University in African Studies where his dissertation focused on the late Imam W.D Mohammed, an American Muslim Revivalist and his contribution to combat violence domestically and abroad. [Update]: Originally published on February 21, 2017 on the Maydan, this piece is updated by the author, Dr. Muhammad Fraser-Rahim, in light of the passing of the luminary scholar Dr. Sulayman Nyang (1944-2018). On November 12, 2018, our friend, mentor, and teacher, Dr. Sulayman Nyang transcended this earthly realm and joined the ranks of the scholars of old to be in the presence of the divine after battling a long illness. 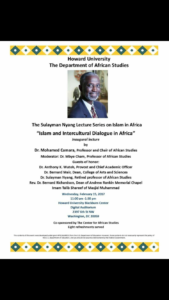 For those who have never heard the name, Dr. Sulayman Nyang is one of the most influential American Muslim academics who has been a pioneer in developing and adding to the understanding of Islam in the United States, Africa and the broader Middle East. Perhaps no other figure, in the tradition of the Pakistani American academic, Fazlur Rahman (1919-1988) has been able to transcend the role of academic professor, public intellectual and the sage qualities of time-honored traditional Islamic teachers, all while being a genuine and down to earth human being. I first met Dr. Sulayman Nyang as an eight year old in my hometown of Charleston, SC where I grew up and we stayed in touch as pen pals up until I was ready for college. I will never forget the moment when I first heard Dr. Nyang. I was at the Moja Arts Festival in Charleston, an annual black cultural arts festival to celebrate African American history and specifically the Gullah/Geechee tradition (descendants of enslaved Africans in the sea-islands of South Carolina and Georgia and who have distinct cultural/linguistic practices still kept intact.) The invited guest co-hosted by the City of Charleston and the oldest Mosque in the city, Masjid Al Jami Al Rasheed, established by descendants of enslaved African Muslims, sought to bring the preeminent expert on Islam in America and Africa to the Lowcountry, the affectionate title given to the low-land areas in the American South. It was during this time that I was first introduced to a man who was able to quickly navigate between quoting Alexis De Tocqueville, Charles Dickins, Thoreau, Ghazali, Thomas Jefferson and very technical Arabic religious texts all while adding humor and making highly complex topics practical for both the intellectual and ordinary citizen. In short, I was in awe and little did I know this impression would shape me in more ways than one. It was during this time of my formative years growing up that individuals like Dr. Nyang helped shape my intellectual consciousness like so many others I have heard around the world having similar experiences. After finishing my undergraduate studies and preparing for graduate school, with my interest in Islamic and Africana studies it was not Harvard, Yale, Oxford or Cambridge as the leading contenders or strong options for me to attend, but instead Howard under the tutelage of Dr. Nyang. Like so many others, I decided to study with the de facto “Shaykh al-Islam” of Islamic and African Studies and to find the deep meaning of life, purpose and at the same time receive a proper academic training in my doctoral studies. I and countless others are no exception in deciding that we would devote our attention and all of our personal and academic time meeting with Dr. Nyang at coffee shops, in hotels, at this home or wherever he was. In fact, we were – and still are – in fact disciples of Dr. Nyang’s work and intellectual legacy in which we see the huge shoes to fill and to carry on his legacy as he recovers from yet another illness. What Dr. Nyang means in his humility, his almost photographic memory and kindness is in fact the extension of a father, friend, and teacher. 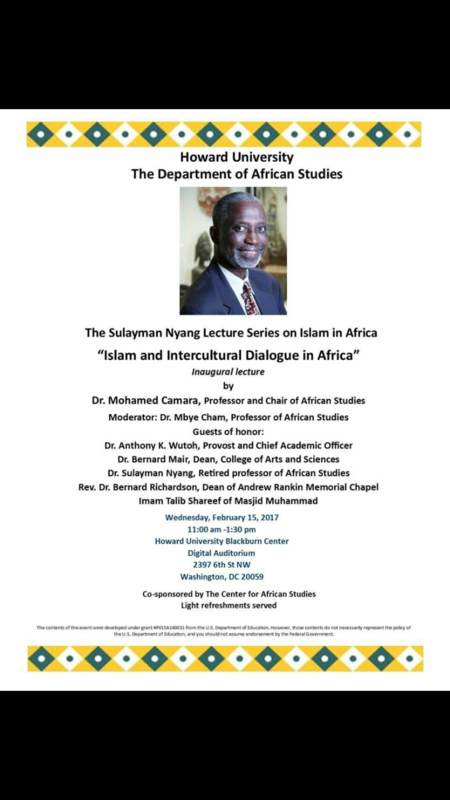 Dr. Sulayman S. Nyang worked at Howard University in Washington, DC until last year when he retired from Howard as a professor and former chairman of the African Studies Department. He joined the faculty of the Department at Howard, shortly after obtaining his PhD in Government in 1974 from University of Virginia and had a long career including a stint as a diplomat in Saudi Arabia representing the Gambia. 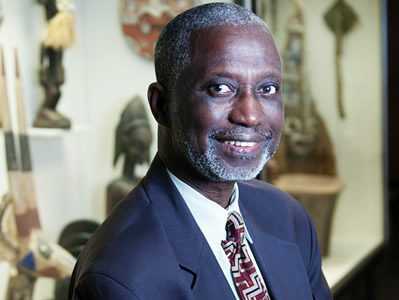 Originally from the Republic of the Gambia in West Africa, Dr. Nyang’s career in academia, local, national and international service and activism spans more than 37 years. 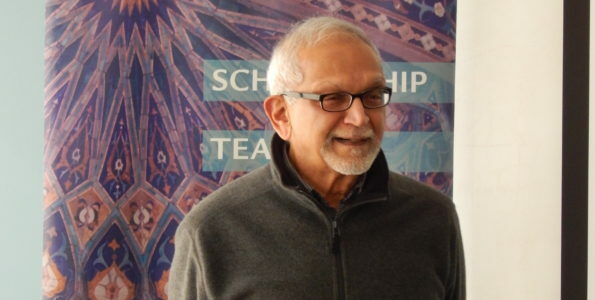 At Howard University, he has been responsible for designing, developing and teaching courses on various topics in African and Diaspora Studies, particularly Islam, politics and philosophy. He has mentored and supervised the work of more than 200 graduate students and many more undergraduates, both at Howard University and other institutions of higher learning outside the US. 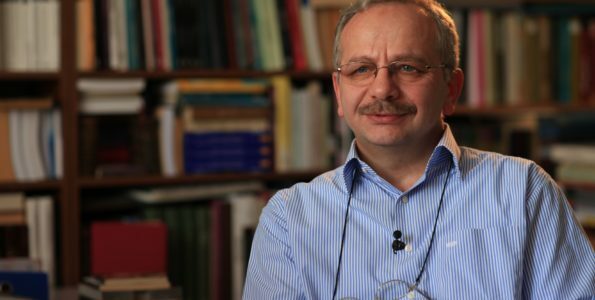 His numerous publications on Islamic thought, African Islam, African American Islam, African political affairs along with Middle Eastern and international affairs topics has made him one of the formidable experts in his areas of expertise, both domestically and internationally. This role as a scholar also includes 11 books and more than 70 articles and monographs, such as: Islam in the United States of America (1999); A Line in the Sand: Saudi Arabia’s Role in the Gulf War, co-authored with Evan Hendricks (1995); Religious Plurality in Africa: Essays in Honor of John S. Mbiti, co-authored with Jacob Olupona (1993); Islam: Its Relevance Today, co-edited with Henry Thompson (1990); Islam, Christianity and African Identity (1984); Reflections on the Human Condition (1984); Ali A. Mazrui: The Man and His Works (1981). Since 2001, Nyang has been a regular contributor to the Washington Post’s “On Faith” online forum where he has written many articles and thinks and opinion pieces. One of the most significant being a piece entitled, ‘What near Death Taught Me about Life’, a reflection on his miraculous recovery from a serious cardiac arrest on May 31 2004. In addition, Dr. Nyang has served on numerous boards throughout the U.S. and the world, and provided expert accounts to institutions, courts, and multinational organizations. One of his most exciting contributions that I know he was certainly proud of is his role in serving as Board member of the America’s Islamic Heritage Museum in Southeast, Washington, DC. This museum is the only museum of its kind in the nation’s capital that preserves and archives the history of American Muslims since the inception of the republic. The Museum catalogues the diverse ethnic, ideological and cultural milieu that represents the American Muslim identity. 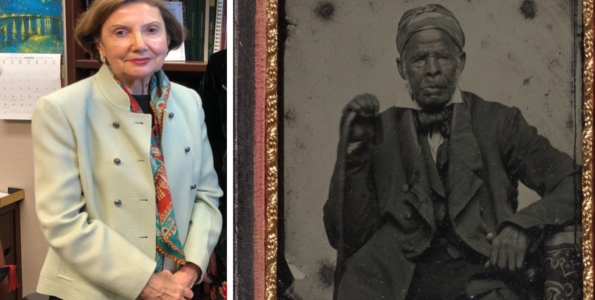 This contribution also builds on Dr. Nyang’s close relationship particularly with the African American Muslim community in which he has been one of the leading experts in documenting the accounts of African American Islam. Starting with numerous articles and interviews conducted with living and deceased members, Dr. Nyang had close relationships with the various Sunni, Shi’i, Sufi and other ideological African American Islamic groups and he has documented their stories and successes. Perhaps, without the role of Dr. Nyang’s engagement on their stories including the late Elijah Muhammad, Imam W.D. Muhammad and other early African American Islamic leaders, their stories might not have been documented and shared with the broader American Muslim community, including Arab and Southeast Asian Muslim leadership who have benefited from the legacy of the African American Islamic experience. To say Dr. Nyang has been a champion of the African American Islamic experience is an understatement, and up until recently, before he became ill, he was a regular staple at the annual conventions of African American Islamic communities. Dr. Nyang on numerous occasions told his students in formal and informal settings that stories are critical and must be preserved so as to document the important contributions in the time they are living. In his words, “ we must always move from being footnotes and move to the main text.” This mantra often times used by Dr. Nyang is one of those famous sayings that any student of his would be familiar with, and an important statement in his encouragement for preserving the African American Islamic experience and other stories in history. Over the years, Dr. Nyang suffered many health issues, but in no way diminished his continued resolve. 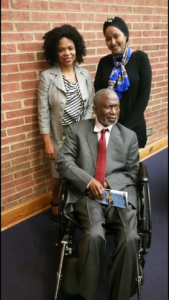 Last year, during an inaugural event at Howard University’s famous Blackburn auditorium on February 15, 2017 that was the kick off of the new Dr. Nyang lecture series and a time in which we celebrated the life of Dr. Sulayman Nyang, included in attendance was Dr. Nyang. A man without a doubt who has had over nine lives, provided nearly meticulous accounts of current events, and though he talked softly, his photographic memory did not miss a beat and it transcended all of us back to his classes at the Howard Center in which most classes were offered in the department he taught in. At this event, it was announced by the newly appointed Chair of the African Studies Department that there was a formal scholarship fund established in honor of Dr. Nyang, and that the soon to be Professor Emeritus would be rightly honored for future generations to come. Dr. Nyang in his death as when he was alive affected generations of students who have been impacted by his humility, humanity, and patience. Like so many other scholars living and deceased, Dr. Nyang’s tradition of spreading the message of religious pluralism, cross-cultural understanding and the preservation of sacred knowledge from Africa, the Middle East and around the world is vital to his life mission. Through his pursuits and students, he has produced around the globe, he has cultivated a tradition for preserving the reflective and thoughtful intellect of all individuals, regardless of their social status, religion or worldview. Dr. Nyang has sought to keep alive the continued use of positive and uplifting ideas to our “mental furniture,” to use his own words. By preserving this global view, we all can continue to carry alive the tradition of our friend, Dr. Nyang and carry his body of knowledge along in the future.